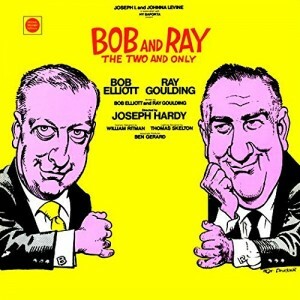 Bob Elliott, who died yesterday at the age of ninety-two, was the longer-lived member of Bob & Ray, a much-loved comedy team whose subtle, at times near-surrealistic routines were developed for radio and never sounded quite right anywhere else. Alas, they first won fame (of a sort) in the waning days of network radio, and so they spent the rest of their lives as fish out of water, never quite connecting with the public at large but attracting a small but intensely loyal cadre of passionate fans, myself very much among them, who loved their oddly tilted brand of humor. Bob & Ray invented, dreamed up the lines for, and then played, mainly on radio and television, a surrealistic Dickensian repertory company, which chastens the fools of the world with hyperbole, slapstick, parody, verbal nonsense, non sequitur, and sheer wit, all of it clean, subtle and gentle…Bob & Ray’s humor turns on their faultless timing and on their infinite sense of the ridiculous. It is also framed by that special sly, dry, wasteless vision of life perfected during the last couple of centuries by middle-class New Englanders. Ray died in 1990, but Bob soldiered on, co-starring with Chris Elliott, his son, in the short-lived but fondly remembered sitcom Get a Life and doing, as was his wont, this and that. He was one of the last remaining ties to the long-gone golden age of network radio. I will miss him very much. All we are not stares back at what we are.